NOTE: This route partially overlaps with the Canal St. Martin route. The (for tourists) little-known Parc des Buttes Chaumont is one of the recreational jewels of Paris. Located in the northeast part of town, it's one of the few bigger parks in the city, set in a dramatic landscape. The ex-quarry has massive cliffs and a big lake, and it's very steep, and beautiful from every angle. And better yet, it includes 5 kilometers of really scenic trails. Just make sure that you show up before nighttime: the park closes at night, at 11 pm in the summer and 9 pm in the winter. 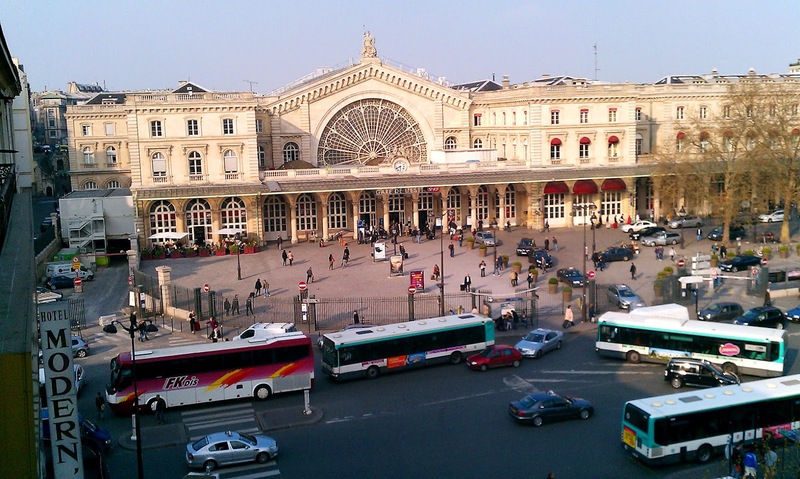 To start our run, we'll meet in front of Gare de l'Est train station, just 2 blocks from Gare du Nord, and easy to reach from a variety of Metro lines. Facing the station, turn to your right and then cross the street (Rue de Faubourg St. Martin) and run into the side street (Avenue de Verdun). Immediately turn right to run through the green gate in the ivy-covered wall, and you'll enter a small park, Jardin Villemin. 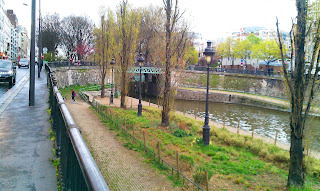 Run through the park and you'll come to the street (Quai de Valmy) along the Canal St. Martin. At the canal, turn left and run up to the first bridge, then cross over the bridge to continue the run on the other side of the canal. But after just 10 meters, at the zebra stripes, turn right to run into the entry between the apartment buildings on the right side, at the Quartier de la Grange-aux-belles sign. 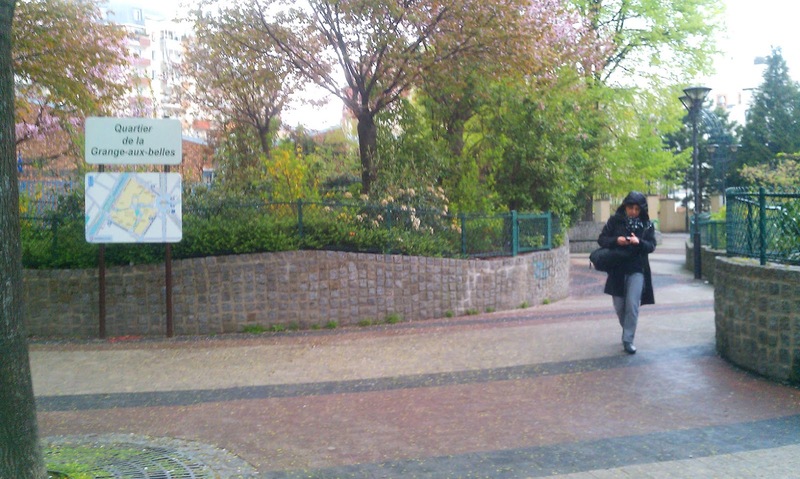 Running through the plaza between the apartments, you'll come out at the oval plaza, the Place du Colonel Fabien. Run straight across the oval, towards the street leading away on the other side, at the modern glass building with the white UFO parked on its lawn. This is Avenue Moreau. Run uphill along Moreau. 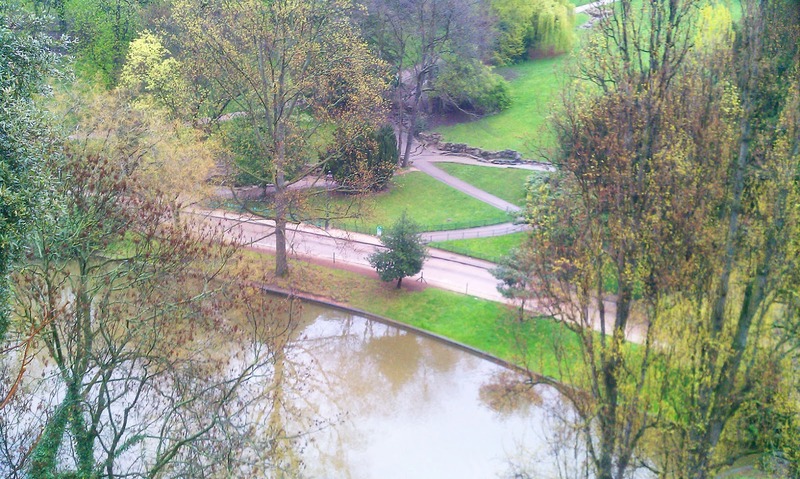 After a few blocks, the street ends at Parc des Buttes Chaumont. You'll see an old red-brick house inside the park gates. Run into the park and turn left at the house. The path forks after just a few steps: run on the right-hand (uphill) section where the path splits. This is definitely a hill run, with a 70-meter rise (did I forget to mention that? Ooops). Up at the top of the ridge, you'll see a path turning off to the left, leading over a ridge to another hilltop, carved out of the surrounding valley when it was a quarry. 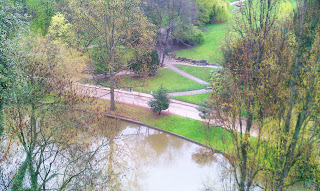 Run up to the round pavillion, the Belvedere de Sybil, 30 meters above the lake, for the best view around. 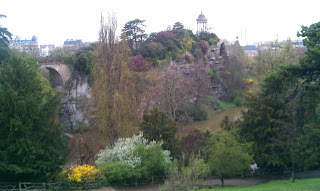 From the pavillion, run south again back over the high stone "suicide bridge" and curve around towards the east (to the left). Don't forget to look back from where you came: the view to the pavillion is amazing. 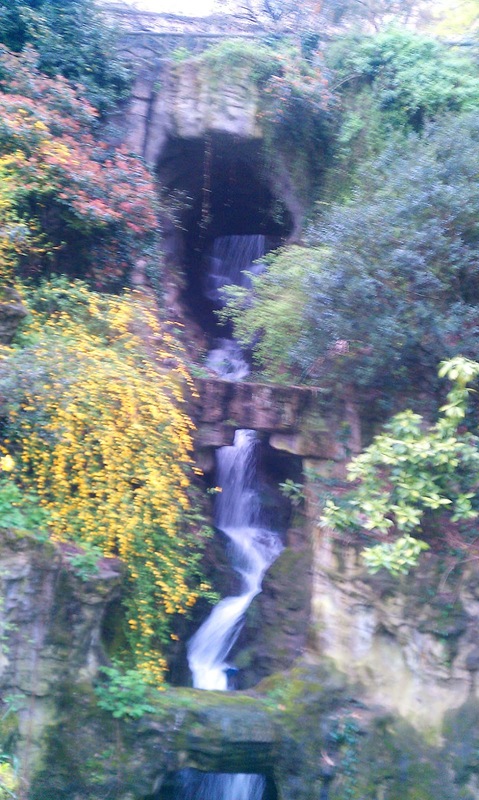 You'd never think you were in the middle of Paris, but in some fairy landscape. You'll also pass a man-made grotto with waterfalls. Along the way, you'll pass one of the trendiest bars in Paris, Rosa Bonheur: people regularly have to wait in line to get in. A single park gate is left open for guests at night, at the intersection of Rue de Crimée and Rue Botzaris. When you get towards the southeast corner of the park, near the Rue Botzaris entrance, take the path that curves downwards to the left, into the valley below. At the bottom, take the path to the left to head around the lake at the bottom of the belvedere, near the outside edge of the park. 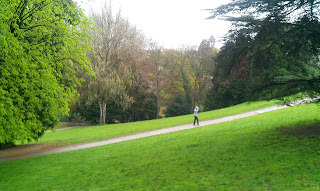 Once around the lake, the path heads uphill (again!) towards the entrance way. Another plus for the park: it has free wifi. In the summer, the lawns are covered with people sitting there typing away with their laptops. Cool idea! When you get to the red-brick house again, head back out Avenue Moreau again the same way you came, this time downhill. You'll definitely have to get back here again to explore the other corners of the park!